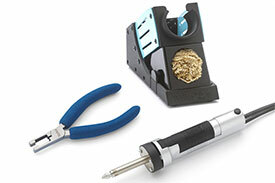 Weller WXDV120 Desoldering Iron is a 120W, 24V high power desoldering iron. The Weller WXDV120 Desoldering Iron heats up within 35 seconds only with stand by function. WXDV120 allows soldering and desoldering parameters to be saved easily on the iron with its internal parameter storage and is setback capable. It also features a blue LED indication light and a integrated tin collector. The T0051320599 Weller WXDV120 Desoldering Iron is one of thousands of quality tooling products available from MRO Tools. Please browse Weller Performance Line Desoldering Irons for tools similar to the T0051320599 Weller WXDV120 Desoldering Iron. T0051320599 Weller WXDV120 Desoldering Iron description summary: Weller WXDV120 Desoldering Iron. Power: 120W Voltage: 24V Temperature Range: 200F - 850F(100C-450C) Quantity discounts may be available for the T0051320599 Weller WXDV120 Desoldering Iron. Please contact MRO Tools for details.